Customer service isn't one person's job. It's not even just one department...So why not tackle every ticket as a team, and bring hallway conversations to your screen? With @mentions, ticket assignment, and workflow rules, sometimes you don't know which agent to choose. You can now simply tag the relevant team, and let them decide who is best suited for the ticket at hand. That's smart collaboration. There's nothing that distributed teams love more than a way to beat the distance. 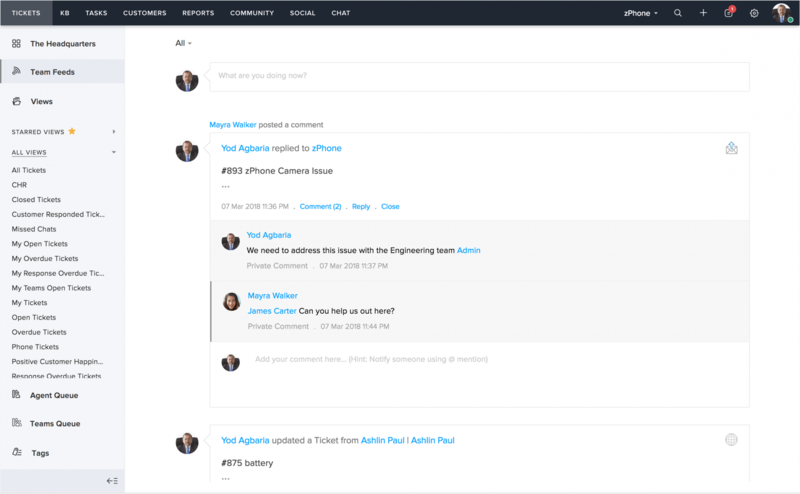 The Team Feed gives you this convenience, enabling in-app conversations with your colleagues. Things just got simpler than ever! Shout out for help by tagging someone. Get together to steer tickets to closure. The Team Feed is the best way to keep an eye on the proceedings. Send notifications to your crew. Do away with having to call a meeting for every little thing! Tired of moving tickets from one place to the other? 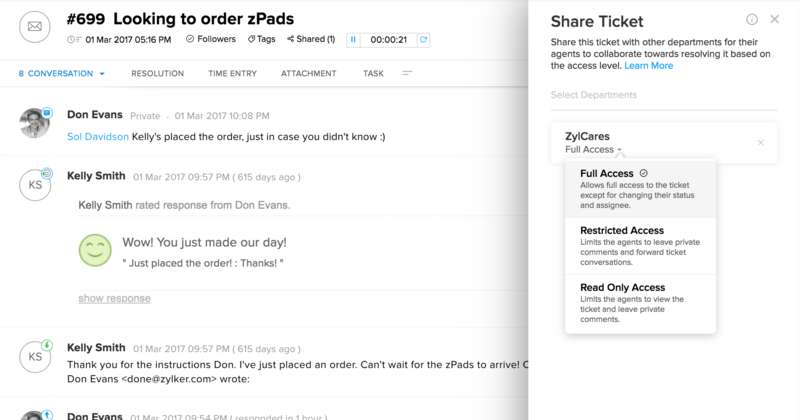 You can now share tickets across departments. And you don't have to worry about having too many cooks in the kitchen. 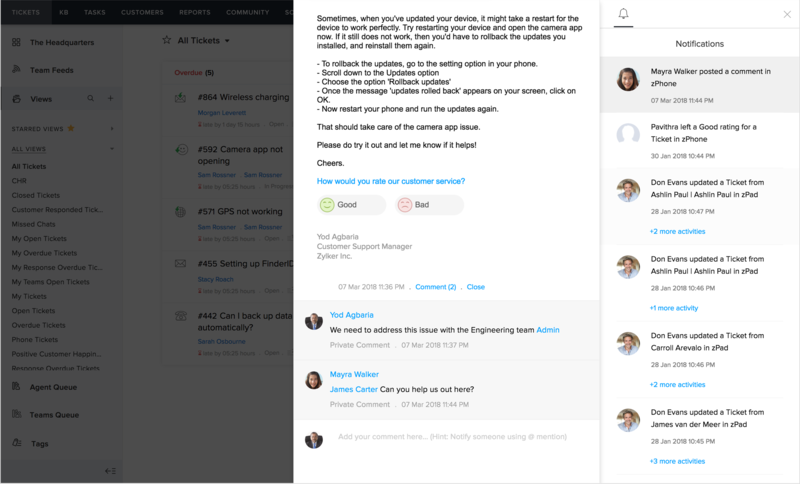 You'll get notified every time someone who has access to the ticket performs any activity on it, so you're covered. The Notification Center brings you every recent development you need to know about in a non-intrusive way. Here, you can interact with your colleagues, and use tags or @mentions to alert them of the latest events. Just like bookmarking a page for future reference, you can tag help articles and even tickets for future use. These tags come in handy when you're working on an issue that's been dealt with before and need to quickly find resources. Often, you need the collaborative effort of multiple departments to resolve a ticket. In such cases, changing ownership of the ticket can get cumbersome. No single agent or department has ownership/visibility of the full conversation. With ticket sharing, say goodbye to this tug of war. Tickets can now be shared with relevant departments while ownership rests with one parent department. Wherever you are, your team is with you.